Montréal, January 11, 2019 – Casteliers, the Montréal Arts Council and Puppet Showplace Theater are pleased to announce that Caroline Bernier-Dionne and Veronica Barron have been selected for the creative research cross-residency between Montréal and New England. Both artists will have the opportunity to work on their respective projects and hone their craft by sharing practices with their host community. Multidisciplinary artist Caroline Bernier-Dionne graduated from theatre studies at the Cégep de Saint-Hyacinthe and trained in figure skating. 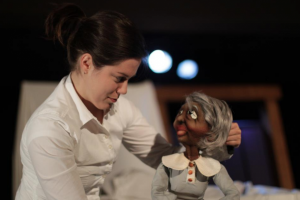 Since 2007, she has been integrating puppetry into her artistic practice and her study of movement. She has worked with the Théâtre de la Dame de Cœur and the Théâtre de l’Avant-Pays, among others, and in film and television. More recently, she participated in the musical comedy Nut Jobs Live at the Olympia, where she was able to experiment with puppets as back-up singers. 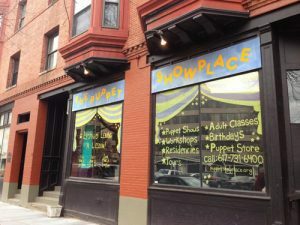 Veronica Barron’s artistic process and training combine theatre, dance, puppetry, clowning and singing. Her artistic work focuses on the body as both familiar and alien, intimate and distant. 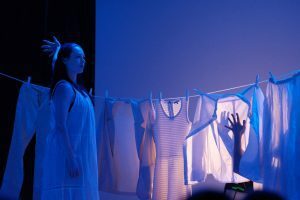 The concepts of gender and vulnerability are also an integral part of her relationship to the body in her theatrical performances that use simple, everyday materials.